A biosecurity battle erupted in New Zealand the day myrtle rust was discovered on the mainland. Since then, biosecurity officials have done everything possible to stop the fungus from taking hold, but in April the Ministry for Primary Industries conceded that we must now focus on long-term management options, turning the battle into a slowly-waged war. In this long drawn out fight for Myrtaceae we are now in reconnaissance mode. Data is more important than ever and citizens can play an important role in gathering information. The Myrtle Rust Reporter (MRR) smartphone app developed by Scion’s Dr Steve Pawson is one of the key weapons we have in the armory. No one knows exactly how or what impact myrtle rust will have on taonga species, including pohutukawa, ramarama, northern and southern rata and manuka, nor the horticultural crops or wider forest ecosystems. The response is now focused on science, learning about myrtle rust, and developing ways to treat it in New Zealand. Through the MRR app, citizens can help officials monitor how myrtle rust is affecting Myrtaceae across New Zealand and, if very lucky, find plants with a level of natural resistance. The logic behind the app is simple. By giving the public a channel to report information straight from the source, you can exponentially increase the number of eyes on the ground. At its best, the sheer scale of data contributed from volunteers enables observations to occur over large geographic areas. The MRR app goes one step further than Scion’s existing citizen science biosecurity surveillance apps (NZ Eucalyptus Pests). Instead of logging a myrtle rust infection and that being the end of it, the MRR app encourages citizen scientists to select uninfected plants, log them in the app and return to them, continuing to monitor their health and if they see symptoms of myrtle rust to report them. 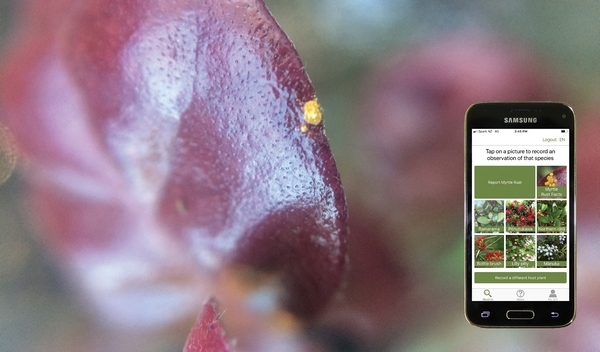 Users log recordings of the Myrtaceae plants through the app (which is connected to the NatureWatch NZ and the international iNaturalist platform), and return regularly to check for myrtle rust, and monitor any infections. To date, the app has been well used. Installed over 600 times, with ~300 uploads from ~66 citizen reporters. Dr Steve Pawson says the beauty of the app as a tool lies in its efficiency. Steve explains, “The nature of the app means that we get information from a wide range of sources that have already been checked by the NatureWatch NZ community. Their data is sent directly to the labs making the transition of information virtually seamless”. Zoe Ogilvie from Biosecurity New Zealand’s Long Term Planning and Transition team says, “Citizen scientists can meaningfully contribute to the biosecurity response. That experience is invaluable if we are going to get every New Zealander involved in biosecurity”. Myrtle Rust Reporter has been supported by the Northland Regional Council, Envirolink, Te Tira Whakamātaki (Māori Biosecurity Network), Biological Heritage National Science Challenge and the Ministry for Primary Industries. 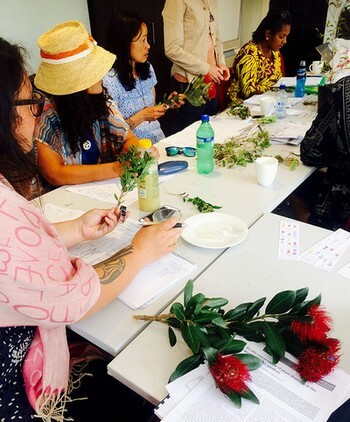 Observing Myrtaceae species at a Myrtle Rust workshop run by Te Tira Whakamātaki.